Quakie’s abandonment of her late-hatching ducklings gave us a new problem and a responsibility we hadn’t counted on. As the hours passed, the chances of her accepting the newer ducklings into her brood diminished. Assuming we could even locate her – the creek is long and there are many hiding places for ducks all along its shores. Most of these areas are private lands, out of bounds to humans (but not ducks). Adding to the delay were one or two eggs that did not hatch till late morning, further delaying the trip to the creek that I had intended to make first thing in the morning. By the time the last duckling was dried and fluffy it was already afternoon. Packing the lot in a small cardboard box, I made my way across a field of very tall grass to a section of the creek we hoped to find Quakie at. The next few pictures show the creek in both directions. 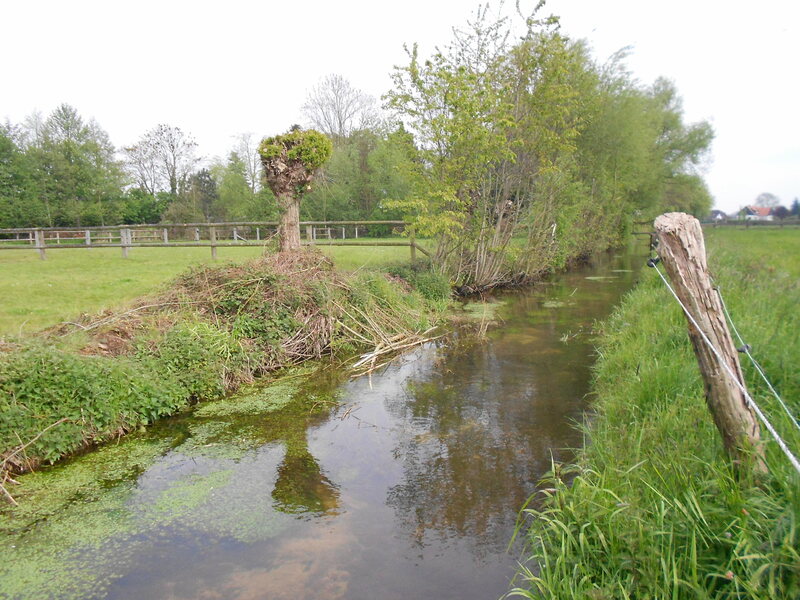 It is bordered on the near side with a rough fence of tree stumps and barbed wire. This is to keep the cows and horses from venturing beyond the perimeter of their respective fields. The other side of the creek is not fenced – these are the back yards of homes on the other side of the creek. 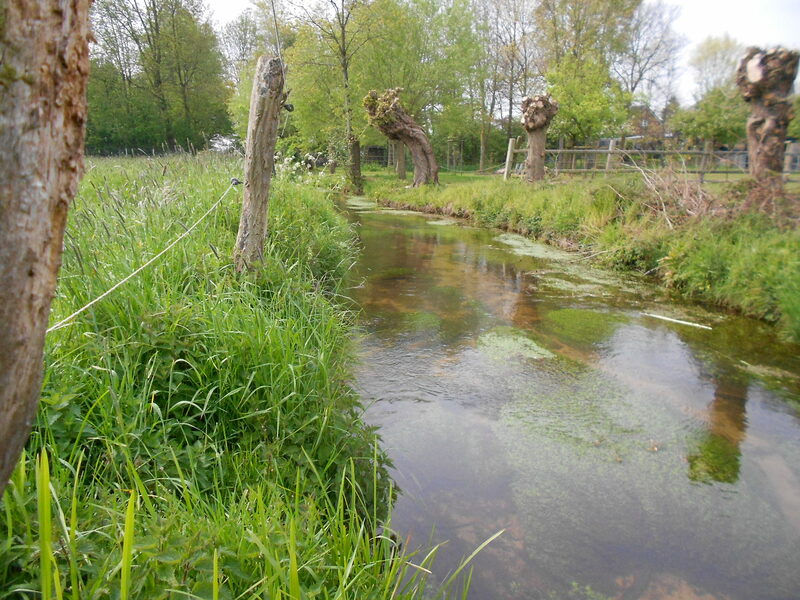 Lots of small shrubs and water plants border the creek there. Wild mallard ducks like to congregate in open areas near the water in this area, since few humans are seen there. In our part of the country, ducks are frequently hunted during the hunting season and the mallards have a deep distrust of humans. Aside from the ducks we raised (and their mates), no other self-respecting wild mallard would come within a hundred metres of any human. Trying to locate Quakie to give her the rest of her brood, I spent an hour at the creek hoping to see her but we encounter only one lone hen, who had her own ducklings with her. Thinking she might be Quakie I called to her. She panicked at the sight of me and the peeping baby duck I had placed near the edge of the water (but not too close). Quacking loudly, she flapped her wings and splashed up and down the creek directly in front of where we were, perhaps calling to the duckling, or trying to determine if it was one of hers, but at the same time terrified of me. I saw immediately that she was not Quakie – her facial features were different, although it was mainly her behaviour that told me she wasn’t one of ours. 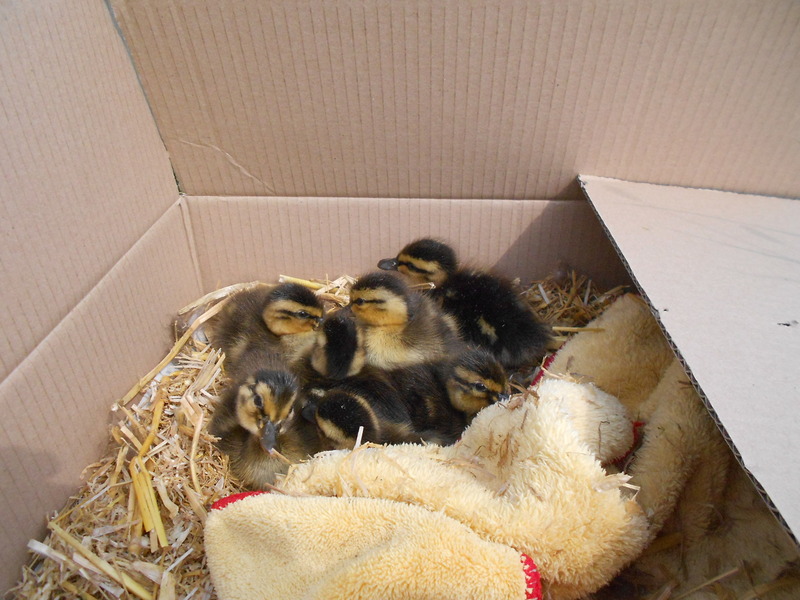 Quakie’s ducklings were tired out from just being hatched hours before and dozed off in the cardboard carton, oblivious to the events around them. After an hour I decided it was time to head home – Quakie may have heard the warning calls of the drakes and avoided the area I was in, which made it pointless to wait any more. The ducklings were put back in the brooder where it was warm, however the ducklings (or at least 2 of them) immediately started screaming their little heads off, insecure at not being able to see me. I eventually brought them outdoors in their little cardboard box and allowed them to run around in the grass and play in the pond a little before taking them back indoors. The exertions of the day had its effect on all the little ones and soon they were all sleeping cuddled up together under the heating plate. I and H. went on a walk around the neighbourhood talking to various neighbours, hoping to find someone who would be willing to take them in, since we would not have the space or time to care for them in the following weeks. Unfortunately we had no luck. Searching online, I found the contact for a wildlife rescue centre specialising in waterfowl about an hour and a half’s drive away. We called and were asked to bring the babies the next day, and if no volunteers were around in the morning, to come in the evening. 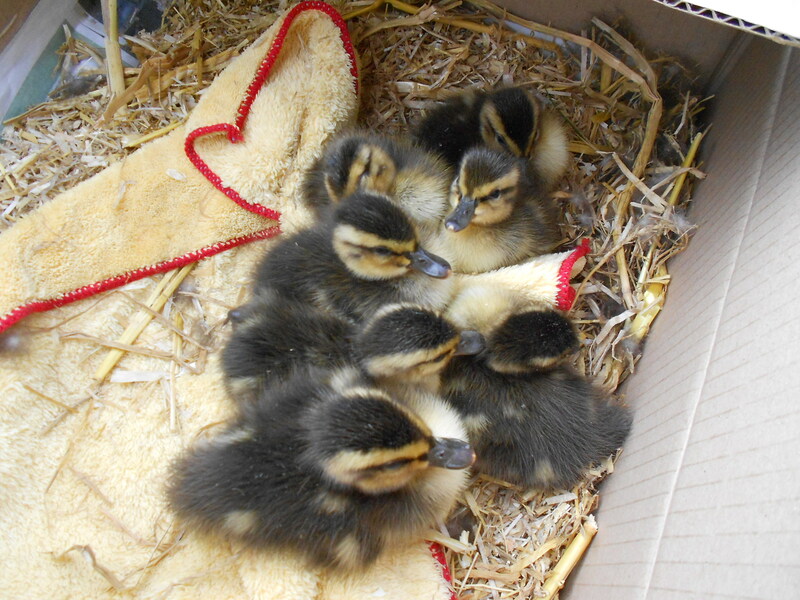 This was both good and bad news – good news that we could find someone who would take them and had the facilities to raise the ducklings till they could be returned to the wild; but bad news that we had to wait another 24 hours. Ducklings grow so fast that by the time they were 2 days old, it would be hard to confine them in a makeshift brooder because all their senses would tell them to escape so they could go to water to feed. I would have to babysit them continuously for the whole of the next day.